The Algarve, Portugal, one of Europe’s sunniest destinations and home to golden beaches bordered by striking red cliffs, tiled churches and ports with white-washed old towns. 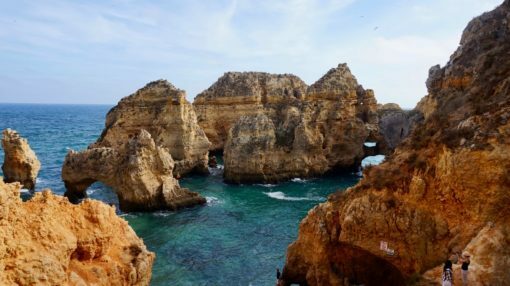 Since we moved here in September, we’ve been on a mission to explore the top Algarve destinations. From boat trips to beaches, castles and historic old towns, check out these top picks in our Algarve guide. 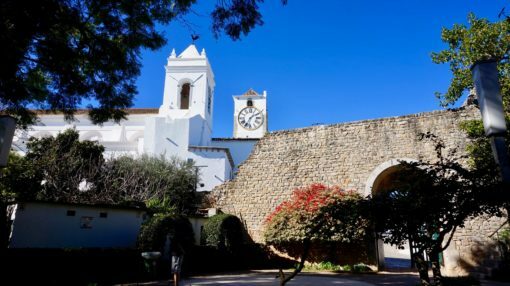 Here are the top Algarve attractions we’ve discovered to date, exploring from our current home near Vale do Lobo, about 20 minutes from Faro. 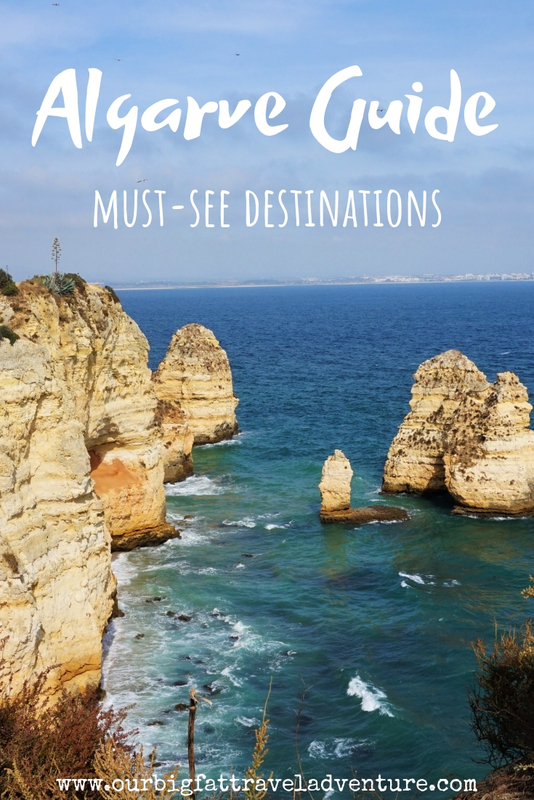 I’ll add to this Algarve travel guide as we continue to explore this year. Lagos is one of our favourite places in the Algarve, on our first trip to the area we housesat in nearby Bensafrim. The city is one of the area’s liveliest hubs with a beautiful walled old town featuring narrow tiled streets and buildings, leafy squares and outdoor cafes. The architecture has a strong Moorish influence, as it was once a key trading port. 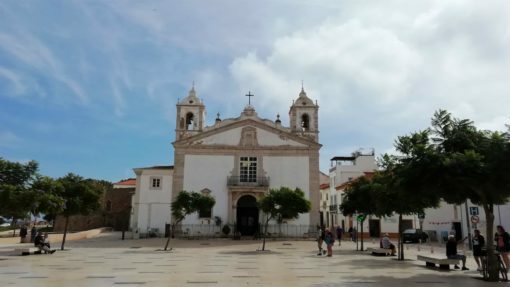 Check out the baroque church Igreja de Santo Antonio, there’s also a city museum. Lagos harbour, which dates back to the 17th century is worth a stroll around, with some cafes overlooking the marina full of chic yachts, sailboats and catamarans. Many of these boats run tourist trips to the Ponta da Piedade rock formations along the coast, as well as whale and dolphin excursions. 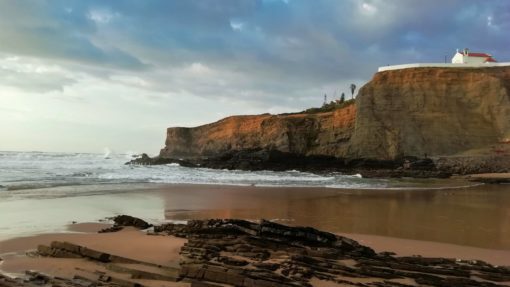 There are some small cove-like beaches along the coast if you’re looking for relaxation, the largest is the Meia Praia. Vegan restaurant picks in Lagos: we love Beats and Burritos and had an amazing acai bowl at Little Break Fast. We’ve yet to try Goji Lounge Café, but it supposedly has a smoothie bowls for vegans and great vegetarian options. We took a boat trip from Lagos with my parents along the coast to the Ponta da Piedade (point of piety). The trip was in a tiny motor boat, small enough to duck into grottos along the way. Sailing along, we passed stunning multi-coloured cliffs, rock stacks and formations. The highlight was the Ponta da Piedade itself, huge gold-red sandstone cliffs that have been worn away by the sea over the centuries. 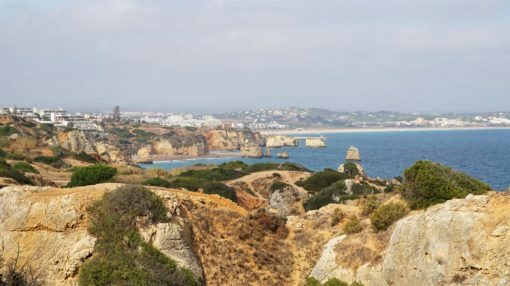 To get another view of one of the top Algarve sights, we drove 10 minutes South from Lagos to a lookout point. From the clifftop, you can see the entire coast stretching off into the horizon. Steps lead down to the Ponta da Piedade itself and there are wooden walkways along part of the coast with scenic lookout points. The cliff paths can be perilous and people fall every year, so be careful when you visit. 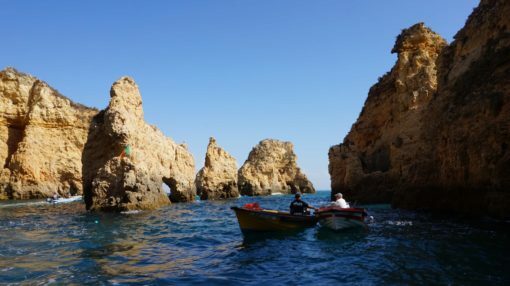 Tips for visiting the Ponta da Piedade: we took a boat trip with BlueFleet, which lasted about an hour and a half and cost 20 euros per person. There are plenty of companies that operate tours and you can book on the day, just head down to the marina where they all have their stalls set out. 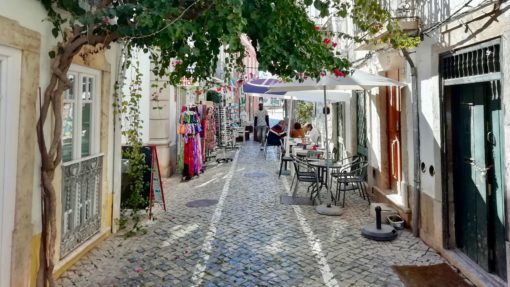 I love Loule because it’s one of the most authentic Portuguese places in the Algarve, plus it’s home to our favourite restaurant: Vegan Joe’s. Loule has bustling streets and medieval alleys filled with bars and restaurants frequented with locals. 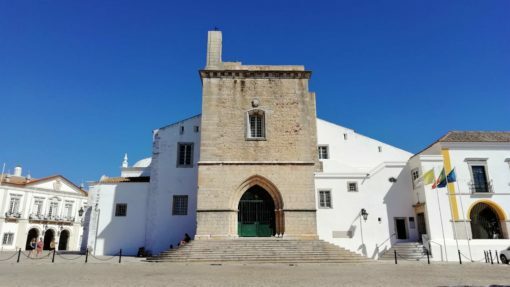 Although most of the castle was destroyed in the 1755 earthquake, you can still explore the towers and battlements of the Castelo de Loule, there’s also a Municipal Museum with Roman and Bronze age artefacts. 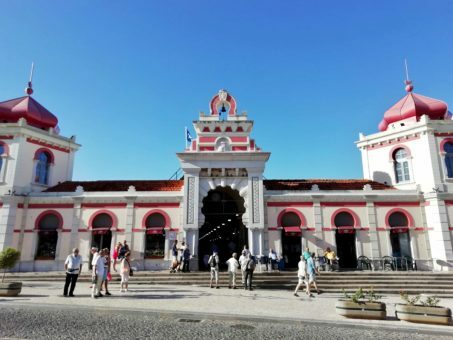 One of the most popular Algarve things to do is visit Loule’s big Saturday morning market, which spills out from the mosque-like, Arabic-inspired Mercado Municipal into the surrounding streets. We shop for all kinds of fresh produce but there are also stalls selling flowers, lace and cork goods made in Portugal. In the summer, the market is extremely popular, visited by coach loads of tourists. Vegan restaurant picks in Loule: our favourite vegan restaurant in the whole of the Algarve is Vegan Joe’s. We love their vegan cheese board, mushroom and leek pie and variety of creative vegan dishes. It’s also surprisingly cheap. The restaurant is really popular with locals, so arrive early to get a table on weekend evenings. Faro was a surprise for us. 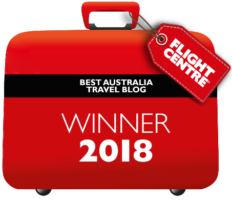 Considering it’s the provincial capital of the Algarve and home to the main airport, we expected it to be the most touristy area. 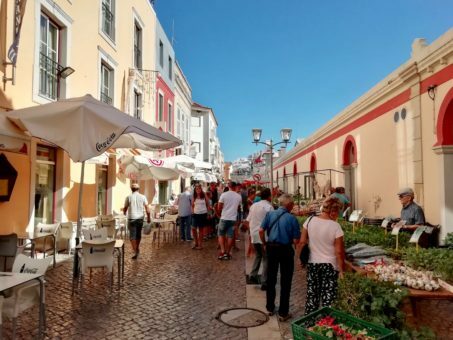 In fact, most people seem to flee Faro for the tourist resorts and beaches as soon as they arrive, so the town has a peaceful feel with a modern shopping area frequented by locals. One of the top city sights is the eerie bone chapel at Igreja do Carmo church. 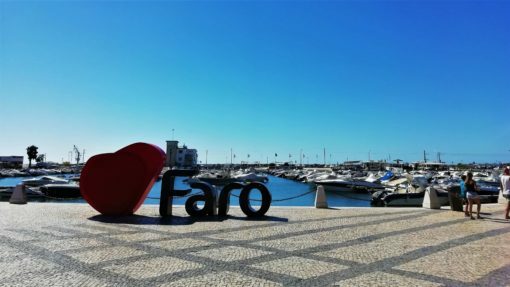 If you’re wondering what to do in Faro Portugal, don’t miss the pretty old town, accessed through a 19th century stone arch near the bustling harbour. We like to wander the cobbled streets lined with shuttered Portuguese buildings, admiring the old wooden doors. The Cathedral Square is a large, open space with a gothic, 13th-century cathedral at its centre. You can climb to the top of the tower for views over Faro and the coast. Vegan restaurant picks in Faro: when we’re in Faro, we usually stop at Mel and Limao, the best vegan restaurant in the area. In the evening they only serve tapas and cakes, but the lunchtime set menu is cheap, tasty and filling. 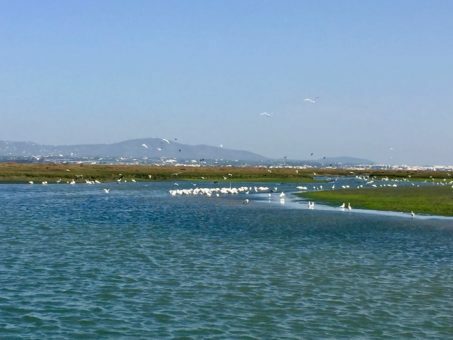 From the harbour in Faro, I took a boat trip with my friend Heather to explore the Ria Formosa Natural Park. This collection of sandy islands and salt-water lagoons forms a diverse ecosystem 60km long which is home to all kinds of aquatic birds including storks, flamingos, spoonbills and egrets. 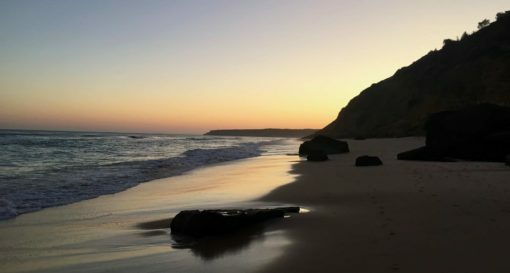 The area is sheltered from the sea by five barrier islands and two peninsulas and is regularly voted one of the top 10 things to do in Algarve. As we sailed across the landscape of dunes, lagoons, islets and marshes we were lucky to come across a flock of birds feeding on a school of fish, dive-bombing the water to catch their prey. We spent the day hopping between four different islands over five hours: Armona, Culatra, Farol and Deserta. Culatra was my favourite, featuring traditional fishing villages and a big red-and-white lighthouse. You can wander along the deserted golden beach, which has spectacular views over the lagoon. Tips for visiting Ria Formosa: we took this 4 island Ria Formosa boat trip, which cost 35 euros and lasted between five and six hours. The guide was great and you can buy lunch at one of the restaurants on the islands or bring your own. We headed east along the Algarve coast to visit the charming town of Tavira. Set on the river with a Roman Bridge, this pretty town has a really authentic Portuguese feel. Tavira is one of the Algarve’s most historic hubs, with Moorish and Renaissance roots. Top sights include the castelo, which is mainly just old crumbling walls with a cute garden and views over the town. Directly next door lies the Igreja de Santa Maria do Castelo, a sparkling white church. 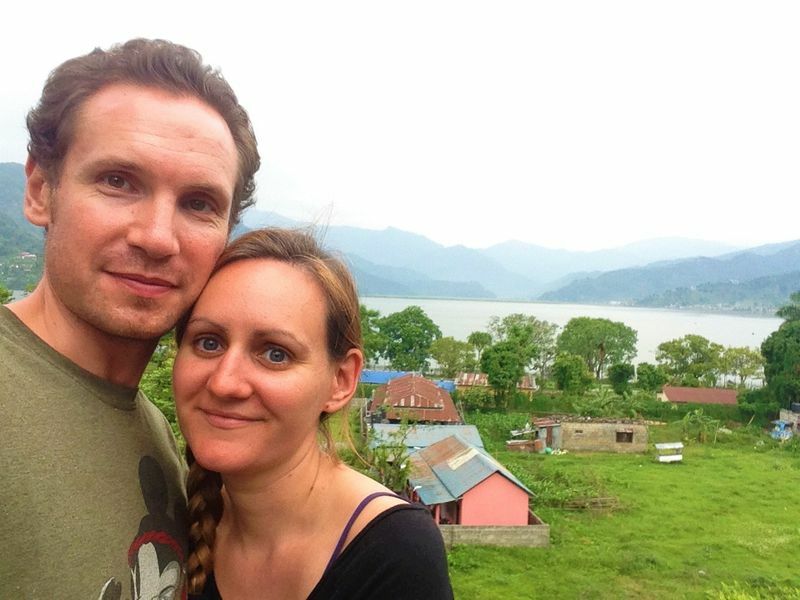 We spent most of our visit wandering around the main square, picnicking in the park and sipping drinks in one of the riverside cafes. 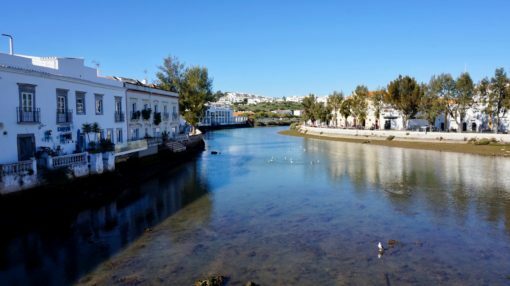 Tavira makes for a great stop on a day trip east from Faro and is definitely one of the more serene spots we’ve discovered in the Algarve. This small white church is worth a quick visit for its stunning interior. The 18th century church is covered in hand-painted, blue and white azulejo tiles depicting scenes from the life of St Lawrence. 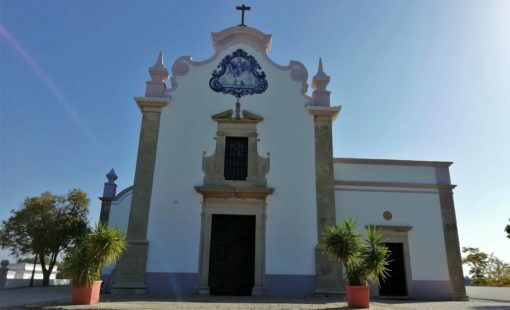 Tips for visiting: Sao Lourenco Church is located just east of Almancil, you have to pay a couple of euros to enter and no photos are allowed inside. 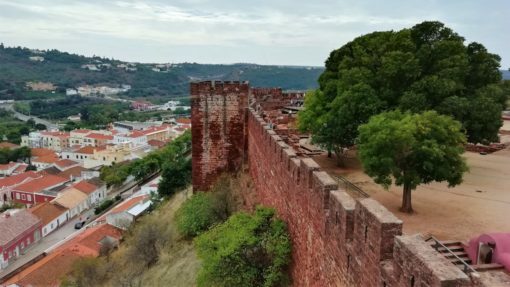 Silves is the former Moorish capital of the Algarve and was once a defensive stronghold and trading hub, founded by the Romans. The town was filled with palaces and gardens, steep cobbled streets and featured a gothic cathedral and big red-brick castle on the hill. 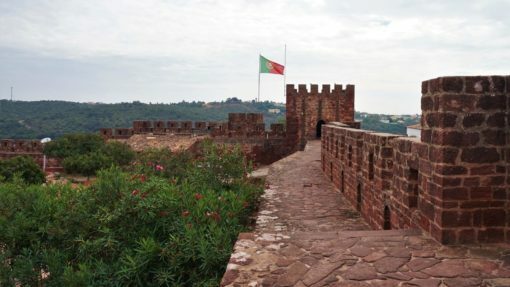 This 7th-century castle was the site of numerous battles and remains one of the key Algarve points of interest. Today, the castle ruins represent one of the best-preserved Moorish castles in Portugal, although there’s not much to see inside. We enjoyed walking around the walls, soaking up views over the rolling countryside and rooftops of the town, as well as eating lunch in the peaceful garden. Tips for visiting Silves: there’s a car park at the base of Silves, which is much easier than trying to park in the narrow streets. It costs 2.80 euros to visit the castle, you can combine your ticket with entrance to the archaeological museum in town for 3.90 euros. 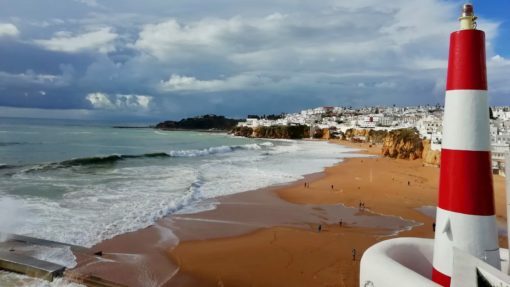 This Algarve guide wouldn’t be complete without mentioning Albufeira. This once peaceful fishing village is now one of the most popular Algarve holiday destinations, famous for its lively new town area and The Strip, which is where hen and stag dos congregate. We stayed in Albufeira for a couple of nights before moving into our apartment and were slightly put off by all the souvenir shops, restaurants offering British food, Irish pubs and general tourist crowds. There are, however, some nice views from the cliffs overlooking Albufeira’s long sandy beach, as well as some picturesque streets and plazas in the old town that are worth a wander. Albufeira definitely isn’t a destination I’d choose to stay in but it’s a good place to stop for an afternoon, especially in the quieter off season. You can also take boat trips from the town along the coast. Andrew visited Sagres on a school trip, but I have yet to go. 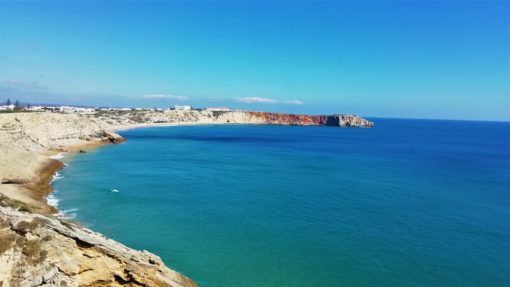 Set in the rugged far west of the Algarve it boasts some top surfing beaches and the Fortaleza de Sagres, a 17th-century fort set on a clifftop. 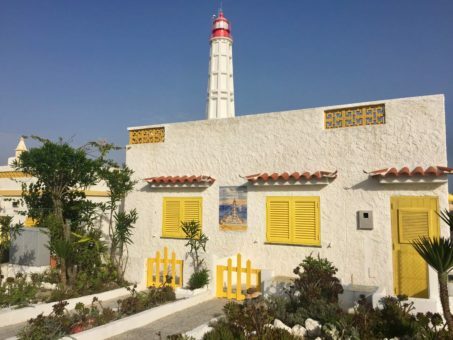 From Sagres, you can head along the coast to the most south-westerly point in Europe, the windy Cabo de Sao Vicente, where there’s a striking lighthouse. Tips for visiting Sagres: it costs three euros to visit the fort in Sagres. I have a few more places I want to add to this Algarve guide when the weather warms up again, including Benagil Cave. 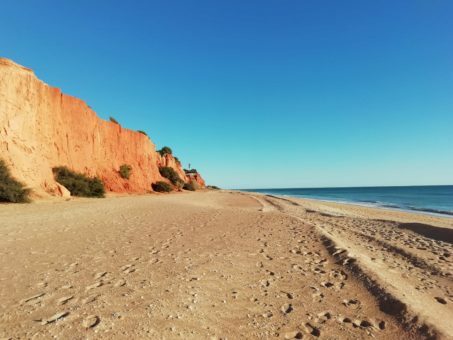 Vale do Lobo – we live just a 15-minute walk from this beautiful, Blue Flag beach and I walk there every day. I love the honey-coloured sand, gentle waves and dramatic cliffs, some topped with golf courses. There’s a collection of (slightly pricey) restaurants right on the beachfront with great sea views, especially at sunset. Vale do Lobo itself is a pretty swanky resort and one of the best places in the Algarve for holidays, although villas in the area can be expensive. 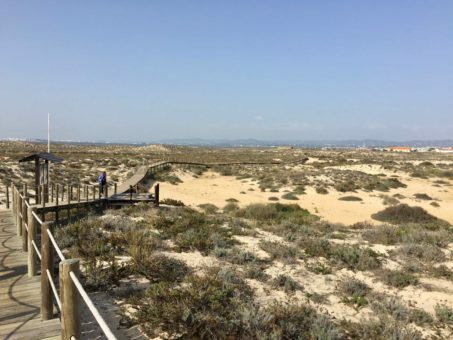 Quinta Do Lago – another Blue Flag beach set just down the coast from Vale do Lobo and part of the Ria Formosa protected park. A long wooden bridge stretches over a lagoon to the pristine beach, which is backed by sand dunes. 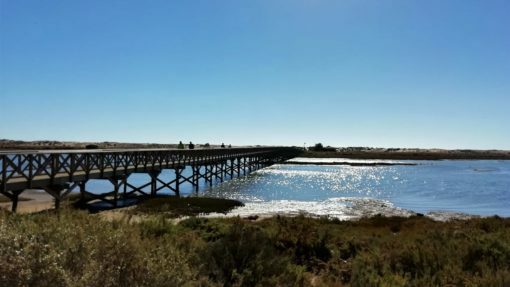 We like walking the path by the lagoon (pictured below), which stretches all the way to Faro in one direction or in the other, to serene marshlands home to wild birds. 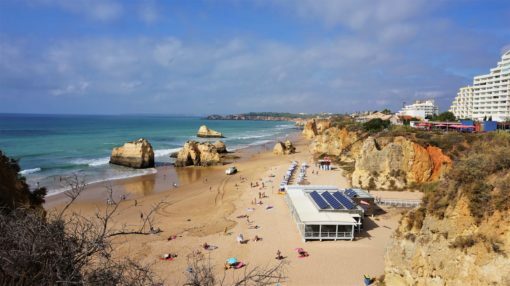 Praia da Rocha – situated in the west of the Algarve, this 1.3-mile-long beach is scattered with giant rock stacks. 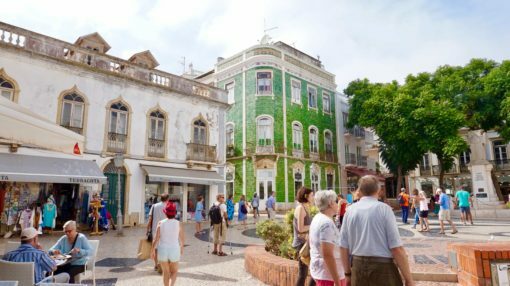 The area was once a holiday spot for wealthy Portuguese families and today it still attracts crowds of sun seekers. Since the beach is so long and wide, it doesn’t feel crowded. Salema – we used to visit this beach when we were house sitting in Bensafrim, in the far west of the Algarve. It was the perfect place to walk the dogs around sunset, when the weather cooled. The short cove is enclosed by those signature Algarve cliffs and boasts fantastic sunset views. Praia da Falesia – the name translates to ‘Beach of Cliffs’ and is lined by huge chunky cliffs. Falesia stretches for six kilometres from Vilamoura to Olhos de Agua and is often rated one of the best beaches in the world. Picture orange rocks, clean, Blue Flag sand, gentle waves and plenty of space. Other Algarve tourist attractions we haven’t visited include the water parks, which are perfect if you’re visiting on a family holiday. The most popular seem to be Slide and Splash, Aquashow Park and Aqualand. We’d personally avoid Zoomarine Algarve, since it has captive marine animal shows and offers swimming with dolphin experiences. The Algarve is renowned as a year-round golfing destination and is particularly popular between October and May when the weather is sunny but not sweltering. There are nearly 60 lush, green courses and luxury clubhouses in the Algarve, one of the most famous is the 18-hole Vale do Lobo Royal Gold Course, which has clifftop views. With its beautiful beaches and clean sea, the Algarve is great for watersports such as sailing and kayaking, especially along the west coast and Ponta da Piedade area. Strong winds mean windsurfing is possible at many beaches, including Praia da Rocha, while surfers find great waves in the west around Sagres and the Cabo de Sao Vicente area. Do you have any questions or comments about our Algarve guide? Let us know in the comments below.